July | 2017 | Azazel's Bitz Box. 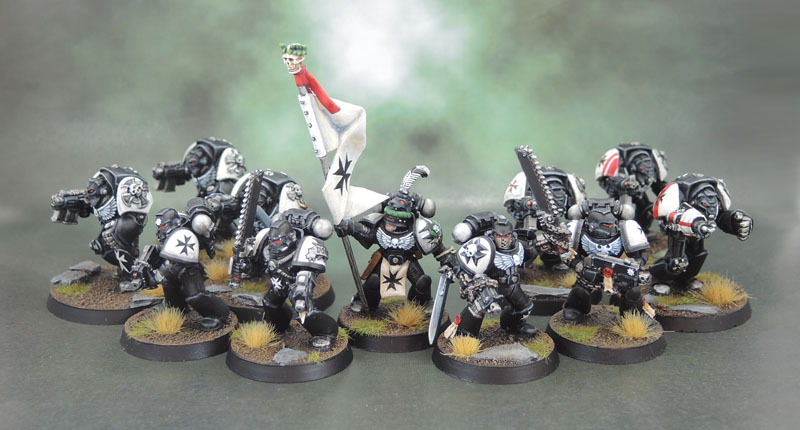 The second unit of my Black Templars Crusade following the Terminator Squad shown a bit over a month ago, is now finished. Or at least, legal. 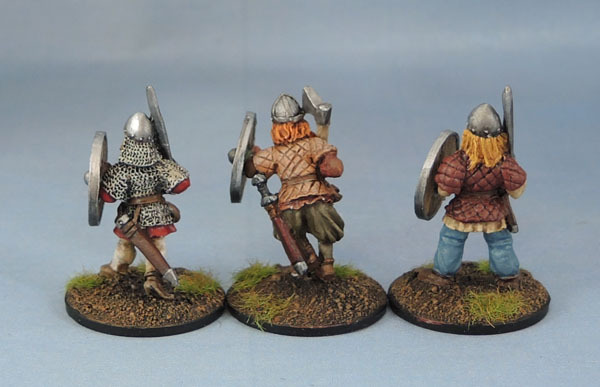 These five Crusaders will no doubt be reorganised in the future, but they’re now a functional squad. 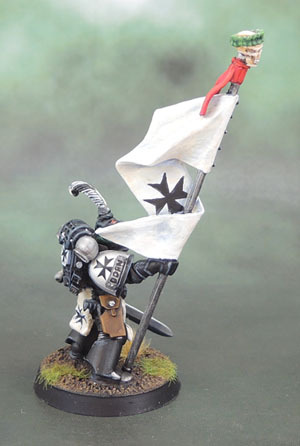 The first of their number is actually the first Black Templars model I ever started painting. 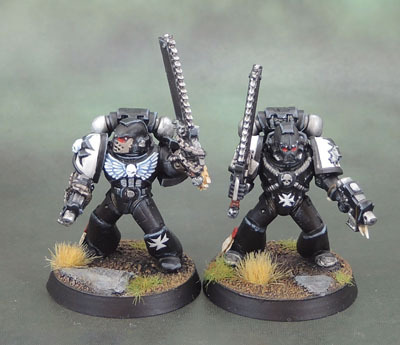 Sometime around 3rd edition and Codex: Armageddon, there was not actually a Black Templars sprue available yet. There were, however, separate metal shoulderpads, and so that is what he was outfitted with. 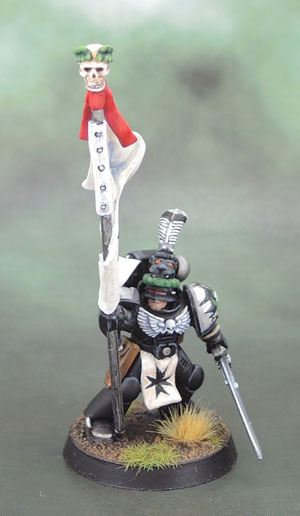 The sword is actually a Space Wolf blade, with the wolf-skull cut down to a human shape and size, and the tabard is one of my very early efforts with greenstuff/kneadatite. As can probably be guessed, his Sallet-style helm with its Panther crest, and the banner arm originally came from the Empire Knightly Orders kit, which sadly appears to have been a casualty of the Age of Sigmar. It is (was?) 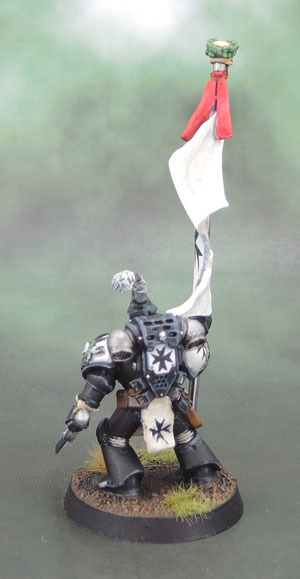 a great kit, that not only made some great looking knights, but was a goldmine for kitbashing and conversion, particularly for forces like the Black Templars. 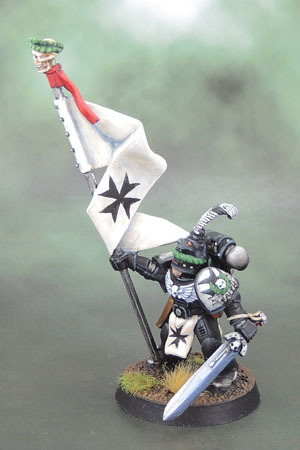 One day this guy may be promoted to Chapter Ancient, though more likely he’ll be this squad’s Sword Brother as the banner is cool but not really blinged out enough to be an Astartes Company Banner or equivalent. 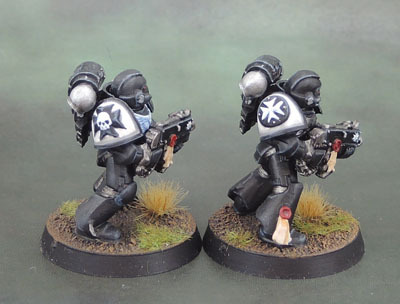 Maybe I’ll have to hang a bolter from his backpack? 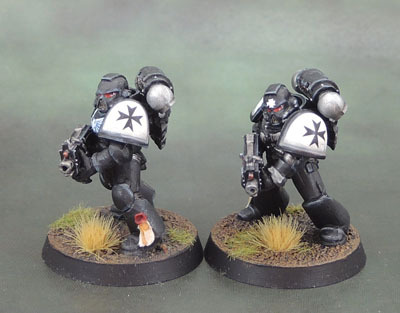 The other four members of this squad – and four of the other five on the painting desk – are essentially more “rescue marines”. Bought from (I think) eBay any number of years ago, assembled and with a spattering of mostly-black paint on them but not especially cleaned up, they sat for years until earlier this year when the impending release of 8th made me look through the various bits boxes and random junk I’d accumulated for 40k figures that deserved a resurrection. The shoulder pad script either says “Dorn” in honour of his Primarch, or “Dorm” in honour of his sleeping arrangements. You be the judge! 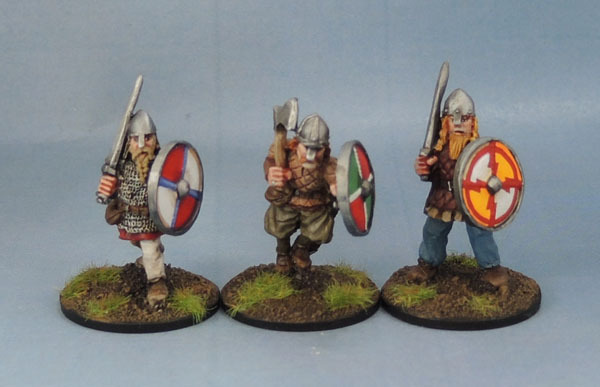 I’ll worry about more detailed squad numbering and designation once I’ve got the next five or fifteen of these guys done. Considering only five are even built, it could be awhile. 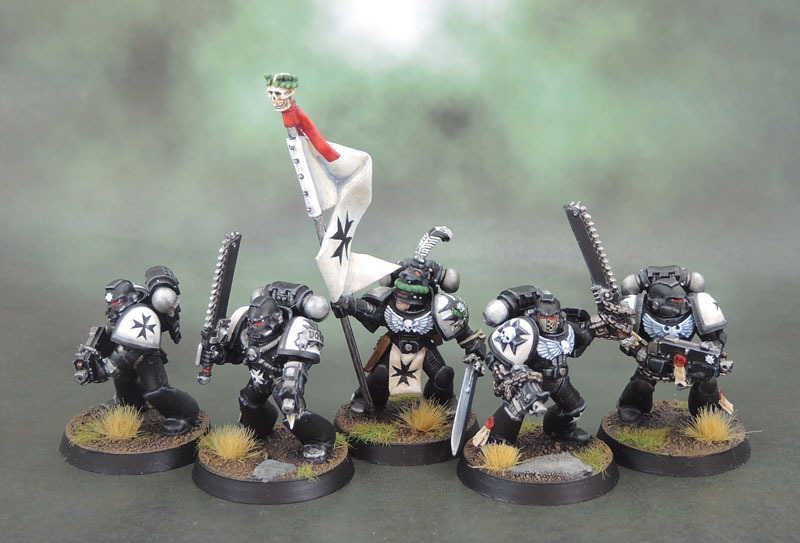 The Black Templars, despite being on my “list” of armies to build and having some very cool models are a back-burner force. I had 10 models built, plus the 6 terminators. Once these are done, there’s an Emperor’s Champion that’s also built and primed. 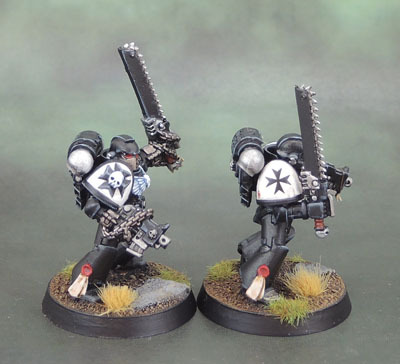 After that I might attempt to get them up to the “2 squads, a hero or two and a dreadnought” level, maybe adding some Sword Brethren via using them as a palette cleanser, but I’ll most likely be concentrating on my “main” forces to get the Minotaurs, Dark Angels and Iron Warriors up to speed before revisiting the Templars with any level of “Army Building Seriousness”. 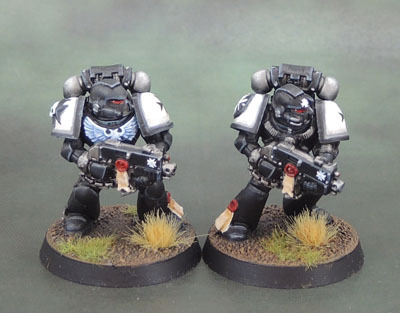 I’ve also got similarly small forces of Space Wolves, Blood Angels, Flesh Tearers and Ultramarines to get to “completed small force” status. 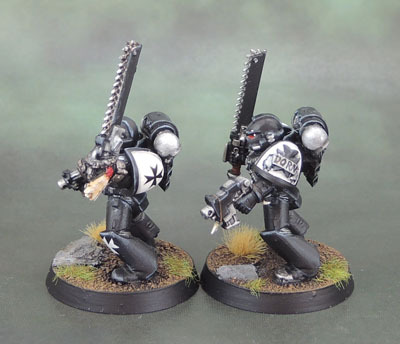 Not to mention my Adeptus Arbites! After a week of not being able to find my camera, and therefore given the option of using my newish phone for photos (sorry, Samsung, you’re not quite there yet) instead, and also not quite sure what I had taken in the last batch, I’ve found it last night! 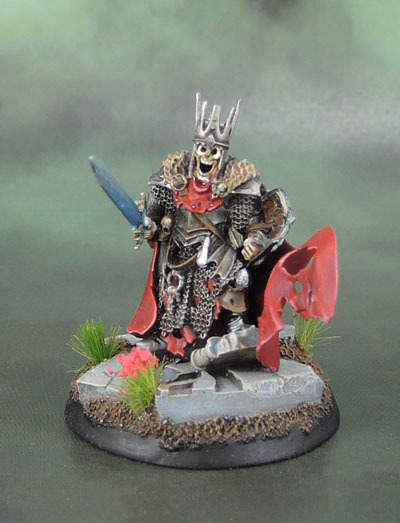 This fine fellow is Citadel’s Wight King with Baleful Tomb Blade, originally released a few years ago as part of the Vampire Counts line, he survived the transition to Age of Sigmar pretty much intact, now being a part of the Deathrattle sub-faction faction of the Death Grand Alliance. 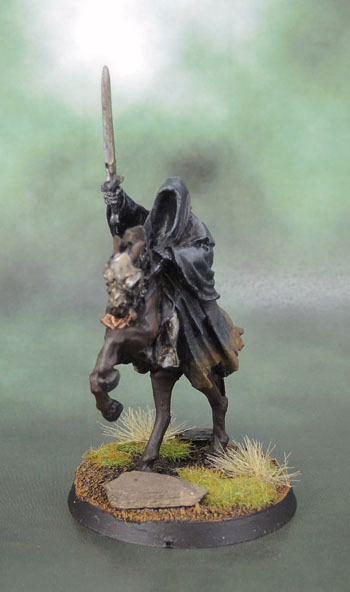 Or to those of us who don’t much care about all of that, he’s a cool looking Wight model. Like, I’m not a guy who hates AoS. 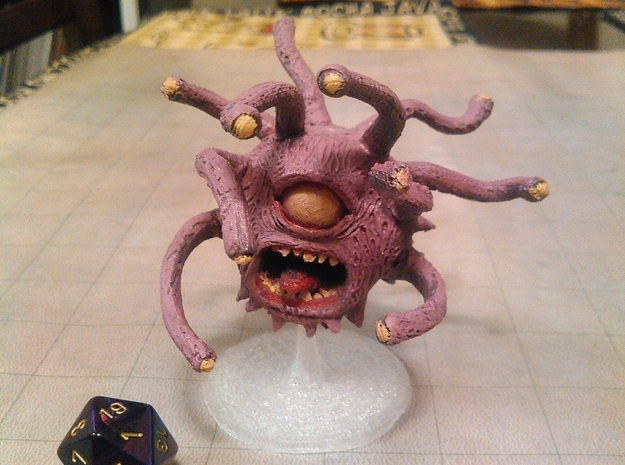 The system is fine, and the models are as great as ever (generally!) but the background doesn’t do much for me, so I mostly ignore it. This lord has an impressive cloak. 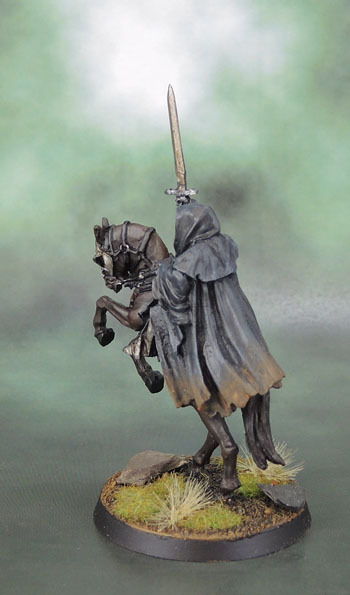 I don’t usually highlight strong colours to white or near-white, especially when using colours as opposed to shades of grey, but this cloak seemed to warrant it as a rare example. 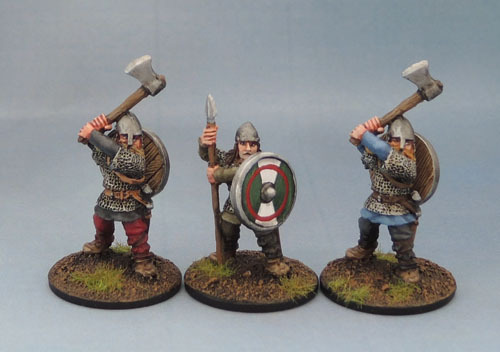 He’s based on a 40mm resin base from Back-to-Base-ix. In retrospect, I think he’d “fit” much better on a 32mm, but he’s been mounted and part-painted since before 32mm based were a thing, and I wanted the resin base to elevate him to more of a hero status. 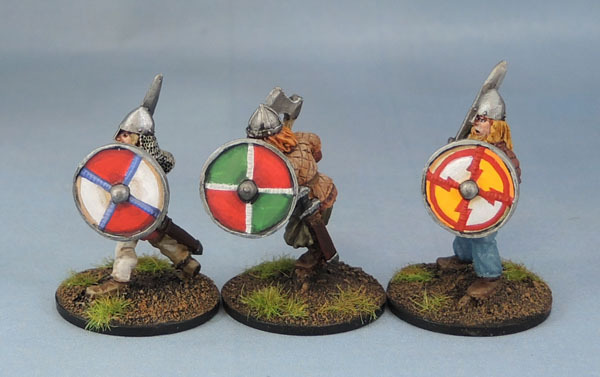 I’ve also used round bases on my fantasy models for aesthetic reasons since long before AoS was a thing, and since heroes in KoW don’t have a facing, I saw no reason to consider changing. 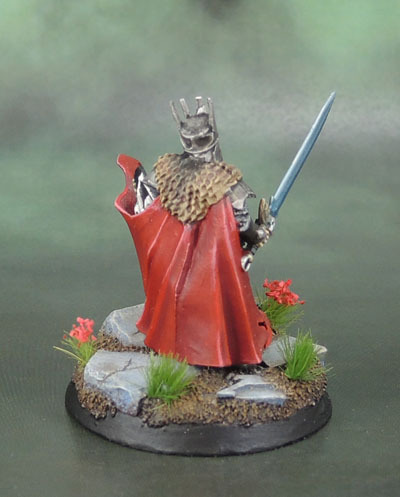 The crimson flowers and grass tie him in with the other heroes in the Undead army. 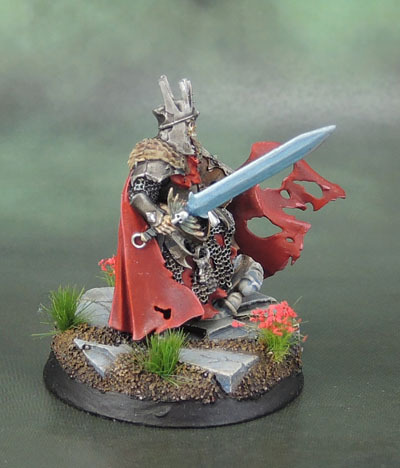 The only strong colour on this model is really the red, with the sword having a blueish tint that marks it as a magical blade, rather than simply an old, corroded one. Perhaps it glows blue when Orc-kind are nearby? 3-D Printer? One on the horizon? Check this out! Sort-of a reblog here, but something worth sharing with the community. It’s actually an older post from Geek and Sundry dating from May 2016 that I’ve just seen a week or so ago. So anyway, I’m not trying to steal G&S’ clicks. So if you’re interested, go have a look at their article and then on to Shapeways to download the patterns for that day when you finally get a 3D printer, in case they’ve been taken down by then. “Old fool!” he said. “Old fool! This is my hour. Do you not know Death when you see it? Die now and curse in vain!” And with that he lifted high his sword and flames ran down the blade. 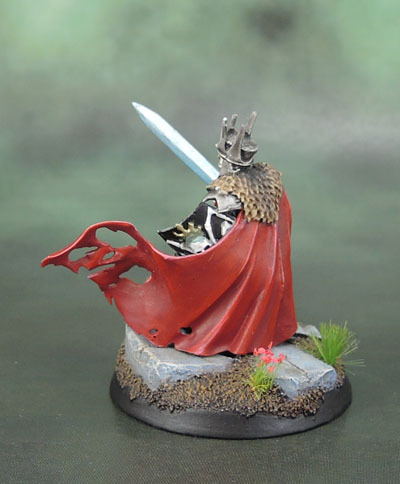 This model of The Witch King was one of the many that sat around half-painted for a measure of years before finally seeing completion at the end of one of my occasional bouts of focused “Just finish that effing thing!” a couple of months ago. With the chaos that has been happening lately, it took sometime to be photographed, and time again before being cropped, and now, finally posted. These were actually the photos I was working on when I noticed the hard drive beginning to fail a couple of weeks ago, as they weren’t saving first time and easily. 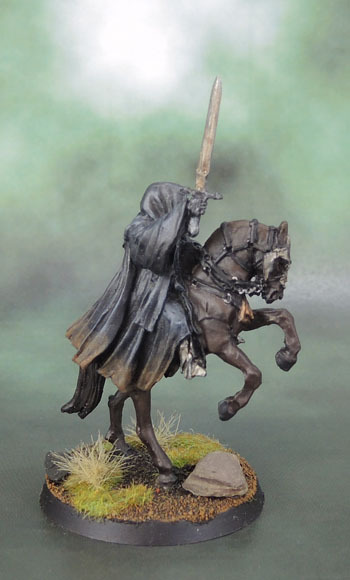 As with the others that I’ve painted previously, I’ve taken some liberties – the Witch-King’s steed here is dark brown rather than black, and I’ve also added the beaten copper to the horse’s icon, both in an attempt to add some visual interest to what could have been a more accurate, but far more boring paint job. 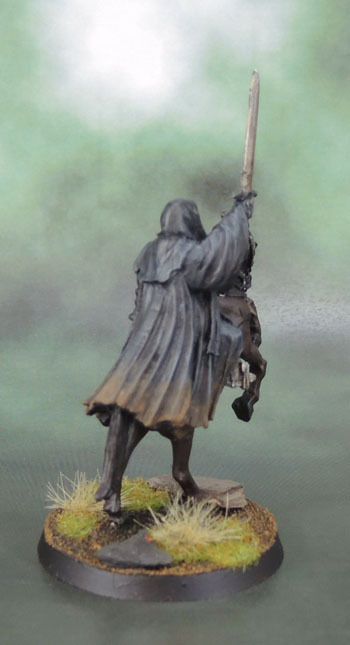 Similarly, I’ve used weathering powders mixed with matte varnish to add a dirty effect to the bottom hem of his robes. 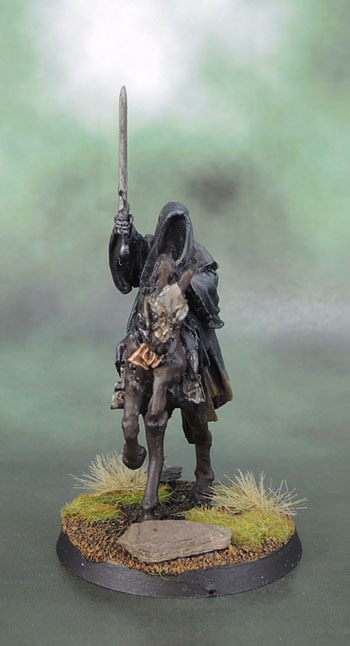 This leaves me with 5 more “basic” mounted Nazgûl to paint in order to represent The Nine in games of SBG and whatnot, though naturally, I have a couple of mounted extras – because that happens when you buy large collections on eBay, plus the foot versions, and a fell beast or two, and also most (all?) 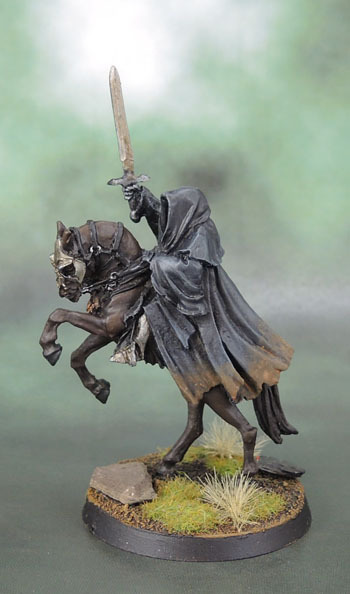 of the “Named Character” versions of the Nazgûl that Games Workshop came out with late in the SBG’s pre-Hobbit life, because BUY THESE MODELS. 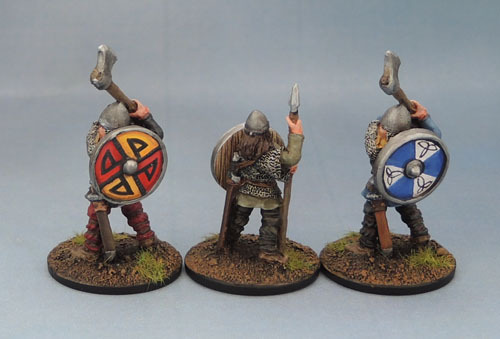 To be fair, though, they’re overall a nice batch of models and as any regular reader of this blog knows by now, owning unnecessary models is kinda my thing.